This cookie recipe is a part of the 2018 Bariatric Foodie No-Flour, Sugar-Free Cookie Collection, sponsored by Sola. Click here to get back to the full collection! Indulge me a soapbox moment. Nothing gets my yoga pants in a bunch like when I look at a snickerdoodle recipe and it is missing THE one ingredient that makes a snickerdoodle a snickerdoodle. Do you know what it is? Do you? Argue me down on this if you want, but a cookie that calls itself a snickerdoodle that doesn’t have cream of tartar is a sugar cookie…trying to be something it’s not. And, really, sugar cookies are respectable cookies. They are a bit…pedestrian…in my opinion…but still. They are a stand-up cookie in every sense of the word. 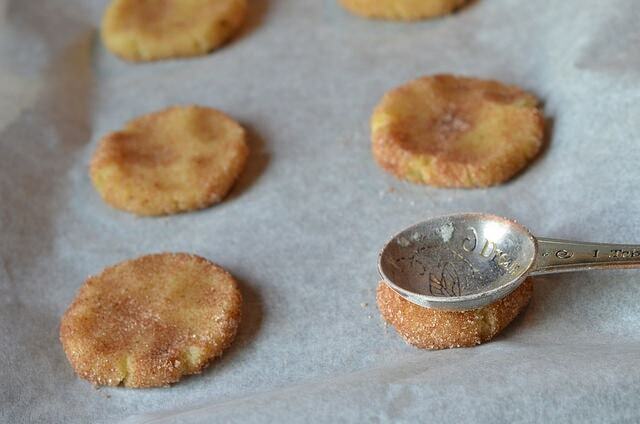 But a sugar cookie is not a snickerdoodle, Foodies. If you remember nothing else I say in this cookie collection, remember that! That being said…let’s get into this cookie! Like with the Gingerbread Cookie, I went traditional on the fat. In fact, nearly everything about this recipe is in keeping with the way I’ve made snickerdoodles since before snicker met doodle. All that is to say, I used butter, folks. But you cook your conscience! If you don’t want to use butter, you can also use something like Blue Bonnet Light baking sticks, I Can’t Believe It’s Not Butter baking sticks or any other solid baking stick. I would not recommend using something that is liquid. That’s going to throw off the texture of your cookie. Butter: A good snickerdoodle has a smooth, buttery taste. Sugar: The cookies themselves aren’t overly sweet, but most people roll the dough in a mixture of sugar and cinnamon before baking. Cream of Tartar: I’ll refrain from ranting about this again, but cream of tartar gives the cookie that distinctive “snappy” taste that differentiates it from a sugar cookie. For the cream of tartar, it took me a few tries to get the proportions right. Too much cream of tartar makes your tongue feel funny. (That’s the best way I can describe it.) So stick to what I have in the recipe below! Not really any, actually! This is a pretty easy and reliable cookie. I’ll say it again, though. 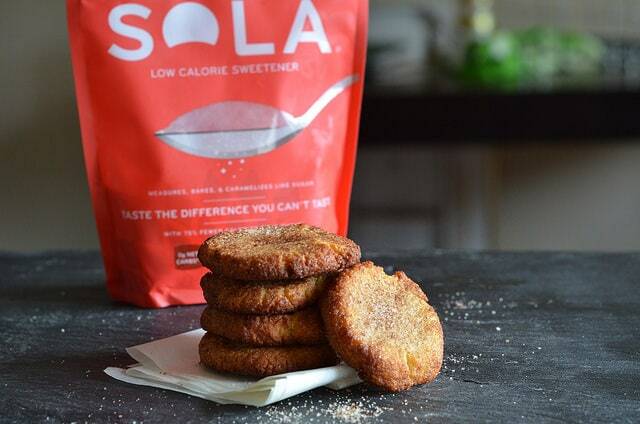 Don’t go too bonkers on the rolling in the Sola and cinnamon. Just a light tossing is enough! Also, I put a range for that amount of sweetener to go in the dough. If you like very lightly sweetened cookie, go with the lower end. I like a very sweet cookie, go with the higher! But just remember that you are going to be rolling it in more sweetener before baking it. I was also concerned about whether or not this would “read” like a snickerdoodle to someone who does mostly sugar-free, like me, so I asked La Petite Diva to take a taste. She said she liked the cookies but something about them was different from a snickerdoodle. You can print the recipe at the bottom of this blog post, but I’ve also put them into a free, downloadable e-book (that you can get your mitts on by filling out the form below). Be sure to snag that so you can take these recipes for a test drive before cookie season kicks into overdrive! For even more cookie inspiration (and if you want to throw a little support to the Foodie cookie cause), check out my Complete Cookie Collection book in the Foodie Store! These cookies are slighly cakey, buttery and delicious, with that distinctive Snickerdoodle flavor you love! In a bowl, mix together almond flour, baking powder, salt and cream of tartar. Set aside. 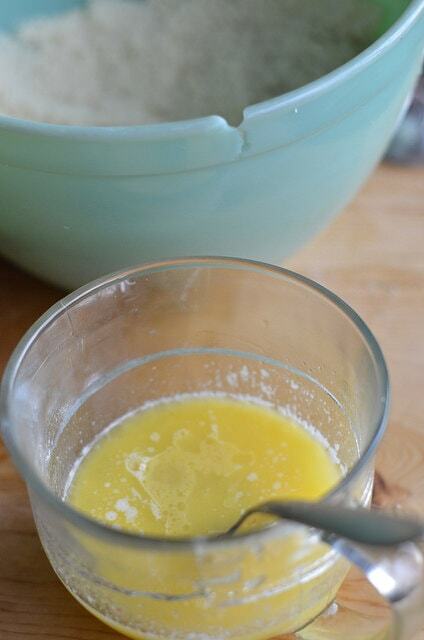 In another bowl, mix butter and sweetener until fully combined, before adding egg and vanilla. Combine wet and dry ingredients and mix thoroughly, being careful to work out any lumps in the almond flour. Consistency should be of a soft cookie dough. If it's more like cake batter, add another tablespoon of almond flour and mix, before refrigerating for 30 minutes. 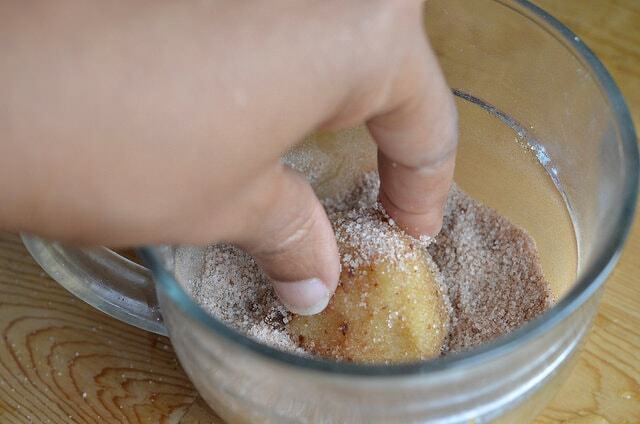 Combine additional sweetener with cinnamon in a large cup or bowl. Drop heaps of dough into the mixture and coat lightly. Arrange dough in two rows on your cookie sheet, and flatten into a disc with a spoon. Bake for 12 minutes, then remove from oven and allow cookies to cool on the cookie sheet for five minutes before transferring them to a cooling rack. Can this recipe be used for a blind backed pie crust and do you have any ideas from a sugar free pecan pie? I’m not sure it would work well as a pie crust. Pie crust recipes and cookie recipes are very different in how the ingredients work together to produce a final result. I’d say this could probably be used as a base for a cheesecake, however, this is a smaller batch recipe so you may need to make adjustments to have enough to do what you need to do. I personally don’t like pecan pie so I’ve never made a regular OR sugar-free version, but I’m thinking the internet HAS to have something for you! Search for one, and if you find anything good, let me know!